In this newsletter read about how long can the bulls take Nifty. Also read about how was our last month in terms of advisory performance. Being 'with markets' is key for successful trader. Last week I had mentioned about sharp move expectation in Nifty. This move has started with Nifty gaining 138 points in last trading session of last week. Most world markets closed in green on Friday. Do we use this opportunity to build longs? 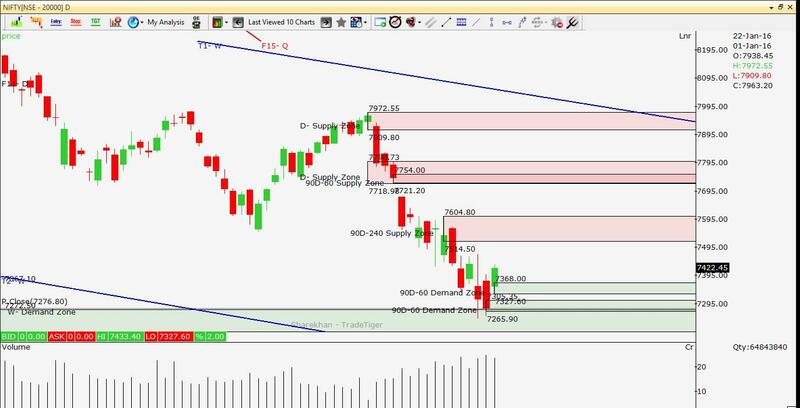 Technical Overview: Last week Nifty made high of 7575 and low of 7402 to close at 7563. A range of 173 points to form a green bullish candle. I had mentioned formation of bullish doji pattern on weekly chart in last week. This week's green candle is confirmation forming Morning Star Pattern. This pattern indicates bullish formation suggesting more upside. Nifty is currently trading near small resistance at 7604. If this resistance is taken out, next resistance is at 7712-7800 range. New support is formed at 7468-7409 range. My View: Ongoing up-move is correction in current downtrend. Major trend remains down. However week to come- Nifty may trade in green. Once it reach its resistance as mentioned above, it will give us clear indication before resuming downtrend again. Till then aggressive traders can enjoy trades on Long (buy) side. Wise man's act: Last month we managed to close both Nifty and Banknifty trades in profits. We maintained our discipline which finally paid off. 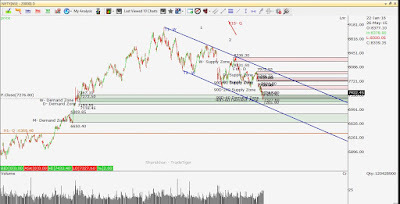 Read more about Nifty and Banknifty trade here. In this post I have mentioned last week's advisory performance. Last month my paid subscribers booked profit in following 2 pairs in Nifty and Banknifty Options. Total profit made in both the pairs is 2% of the margin utilized. We could manage to earn some profits in highly volatile month, though many traders suffered huge losses in Jan 16. Below are the details of Nifty trade out of both the trades. On 6th Jan we began with pair trade in Nifty. This is how trade went. This is called as Short Strangle Strategy. Read more about Strangle here. There was support near 7550 as it was earlier bottom in Nifty and there was a Demand Zone (Kind of Support) around 7381. Moreover this (7400) level was about 400 points away from 7784, on which Nifty was trading on 5th Jan. Choosing 8000 for selling Call Option was relatively easier, as major trend in Nifty was down. And there was Supply Zone (kind of resistance) on Nifty chart near 7909-7972 level. Read more about Demand and Supply to identify high potential trades here. Immediately on 7th of Jan India VIX shoot up to around 19. This made Option premiums to shoot up. 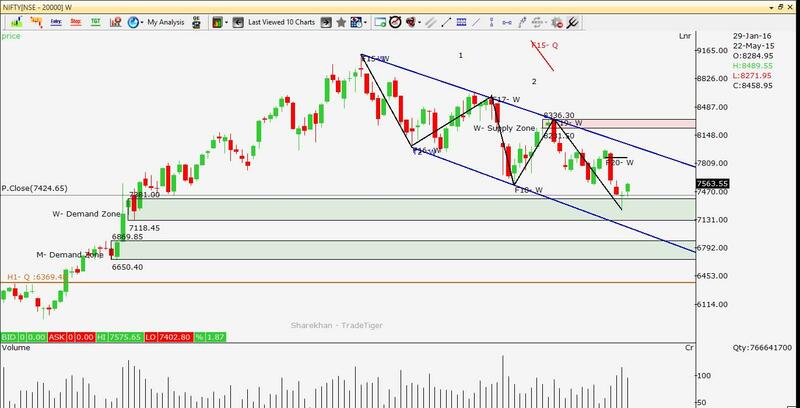 Nifty had gapped down on 7th of Jan. This was first bad sign for us. After that Nifty fell continuously for 11 days barring 2-3 green candles. That was alarming. But we had no time to move out of 7400 Put Sold which was showing losses. In the meanwhile 8000 Call Option had lost almost all the premium (which was profit for us) and was trading at Rs 5 on 12th Jan. It was difficult for Nifty to rise from this point to move all the way beyond 7600. Hence I decided to book profit in 8000 Call at 5 and Sold 7800 Call at 21.5. This gave me additional premium of around Rs 16. While Nifty was falling, 7400 Put was showing notional losses and 7800 Call was earning us the profits. On 18th Jan when Nifty was trading at 7350 we decided to close Nifty 7400 Put at a loss, which was trading at 103. At the same time rolled over this position to 7200 Put which we sold at 37.5. This decision was taken looking at increasing VIX which was then trading at 20.2. India VIX trading beyond 17 is always risky for Option Sellers. The global markets too were falling continuously. Though, there was demand zone at 7381, we decided to close the trade, as zones can be broken in volatile markets. As a trader we have to have our risk management in place. Later, as all of us know, Nifty bounced from this level and closed above 7400 to end the series. However keeping 7400 Put alive would not have been wise from risk management perspective. So even after huge volatility and global uncertainty we managed to end month in profits. This is beauty of Options strategies. Learn more about my Index Options Portfolio here. Now trading at lower end of the channel. Will it resume reverse to touch upper end of the channel? My Prime Cash portfolio completed 6 months. This portfolio has given returns of 32.6% during this period. Check the detailed performance here. This portfolio invests in socks for short to medium term. In this newsletter read about how much upside to expect in Nifty. I will also speak about whether current low is Nifty bottom. I had mentioned a support to Nifty at 7368-7194 level. This support is nicely held by Nifty to give a upward bounce of more than 170 points from its low. Global markets are giving positive indications. Most Asian, US and European indices closed in green to end the week. Question Is this the end of fall and start of new rally? 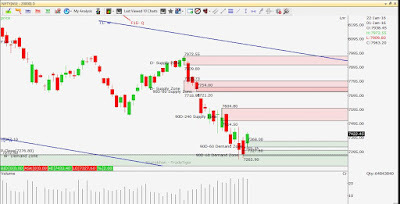 Technical Overview: Last week Nifty made high of 7471 and low of 7241 to close at 7422. A range of 230 points. 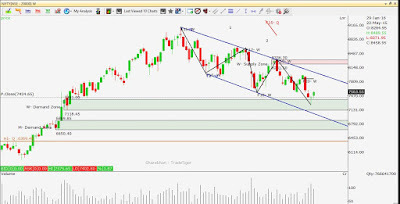 On weekly technical charts Nifty has formed a bullish doji pattern. This pattern indicates immediate upcoming upside. The overstretched fall, oversold nature of indicators and the Doji pattern formation gives us indication that Nifty can have some upside from current level. This upside can continue till next resistance of Nifty. Resistance is at 7514-7600. If this resistance is broken, further resistance is at 7718-7798 level. The expected upward movement in Nifty is just a pullback in ongoing downtrend of Nifty. Major trend still remains down. 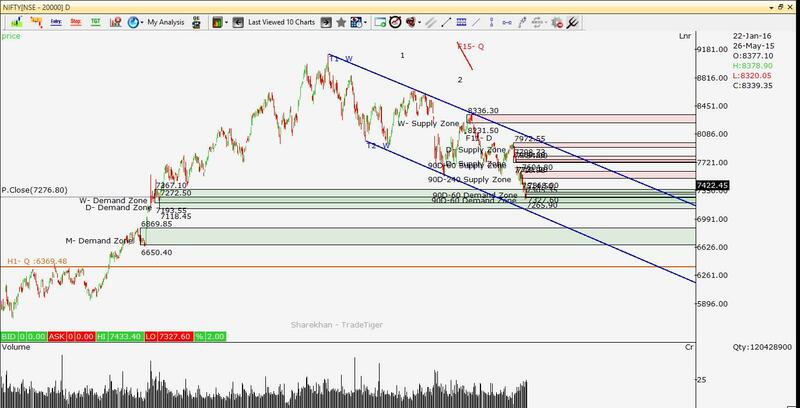 If Nifty breaks below 7193, it can have major downfall till next support near 6869. However this downmove may take sometime to come about. It is market's nature to surprise everyone. So be ready for sudden moves as India VIX is still trading above 18. And we have major event of budgets lined up ahead. My View: Nifty seem to be ready for a sharp upward move. This move may last longer than expected. Check the trend line in chart below. I have uploaded 2 charts depicting shorter and larger pictures. The trend lines gives us much lower target of say 6800 if it breaks below current level. 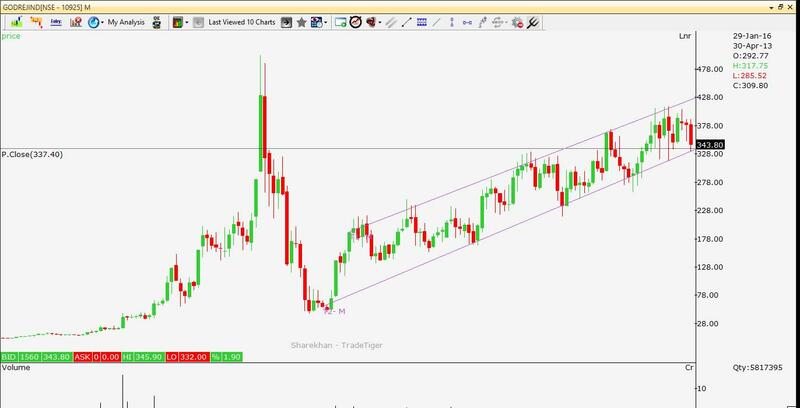 Short term traders can play on long side for a pullback. Long term traders can create short positions on rise near resistance. Wise man's act: Patience and discipline will pay you in markets. Not only the analysis. Our Nifty and Banknifty Strangles have tested our patience this month. But seems it will pay off to give us profits. More on this on next weekend.